Making your own organic dog biscuits is a fun way to show your dog how much you care. These little treats are both delicious and good for your dog. Organic food is made without the use of harmful pesticides and herbicides. When you make organic dog biscuits, you also save money. 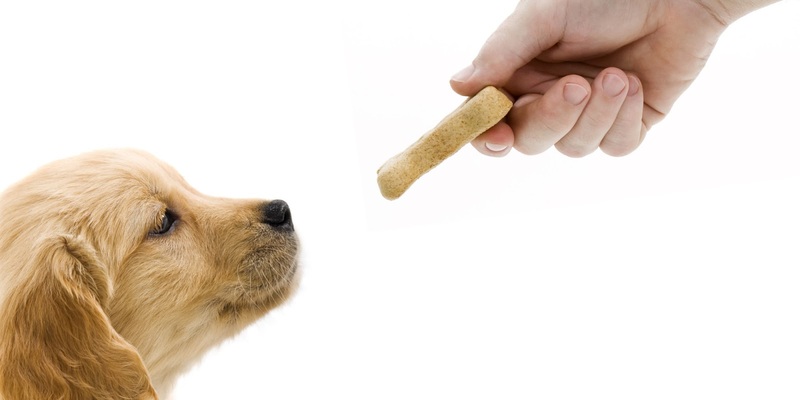 Buying packaged natural or organic dog treats in the store can be quite expensive. Why not give your dog the same thing for less money. Your dog will thank you! Preheat your oven to 350 degrees for at least a few minutes. Combine 2 tbs of olive oil, 1 cup of water and ½ cup peanut butter in a bowl. Mix all ingredients very thoroughly. The next step is to combine both flowers together. Add 1 ½ cup of each type of flour and mix with other ingredients. You will need to add the flour in gradually while mixing. Continue doing this until you have thick dough. The next step is to knead and roll the dough into a ball with a rolling pin. Use wax paper and extra flour to prevent the dough from sticking to the rolling pin. Continue rolling the dough until it is nearly 1 inch thick unless you would like thinner dog biscuits. Next use a dog shaped cookie cutter to create dog bone biscuits. If you don't have a cookie cutter, simply cut out squares with a knife. Bake your fun shapes in the oven for 20 minutes or until they are golden brown. Once the organic dog biscuits are done cooking take them out of the oven and allow them to cool. Keep them stored in an air tight container. Warning: Never add chocolate, candy or any sugar to the ingredients. Chocolate can actually make a dog very sick and too much sugar is not good either. The peanut butter will provide enough taste for your dog to feel satisfied.